Note: This blog is a bit different from my normal postings because this blog posting is the entire trip, after the fact. Had a problem writing the blog with my Samsung tablet. So New England Leaf Peeper blog is a long one. 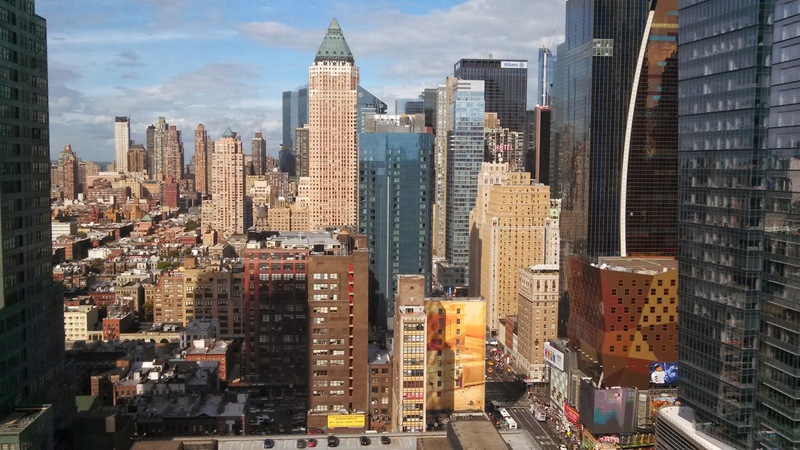 After an uneventful flight from LA to JFK, getting from the airport to downtown Manhattan was a lot simpler and faster than we had anticipated. From the terminal we took the Airtrain to Jamaica Station and from there we got on the Long Island Railroad (LIRR) to Penn Central. Our hotel, the Element, was a short walk away. NYC from our room on the 36th floor. After checking in and having breakfast, we found our way to where Maarten, Erika and Gaby were staying. We ran right into all three at the hotel's restaurant, just finishing breakfast. After a few hugs, there was no delay in starting the tour of the Big Apple. 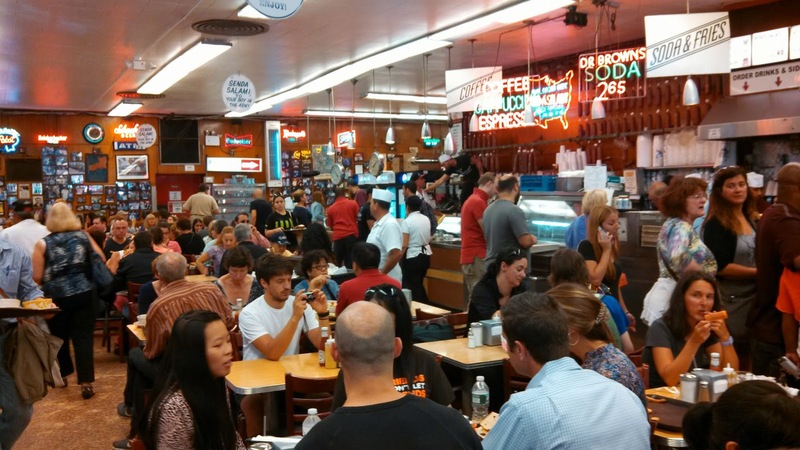 We walked over to get tickets for the Empire State Building (for later in the day) and then visited Greenwich Village, where afterwards, we walked to the historical Katz Deli (established in 1888) for a pastrami and rye accompanied with a cold beer. 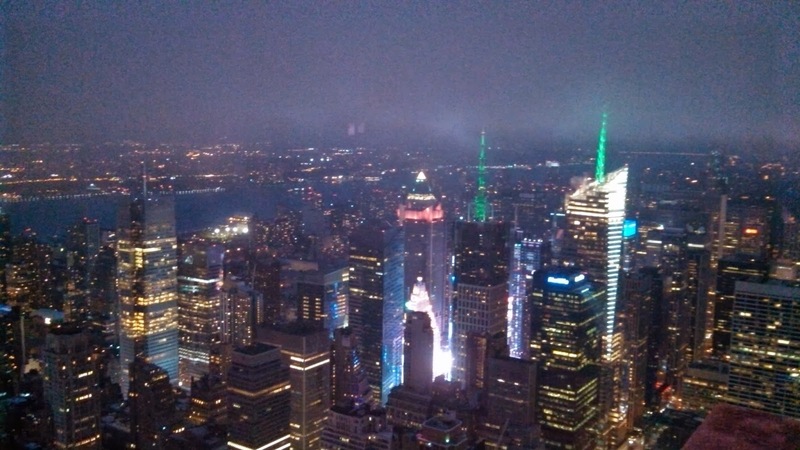 Later in the day, by the time we made it up to the Empire State Building it was cold, dark, windy and somewhat foggy. The visibility was not what we had hoped for, but none-the-less it was worth the effort. The following day we visited the 9/11 Memorial. The pools were beautiful, moving, dramatic and inspiring. Names of the victims surround the two pools that represent the two buildings. Also, next to the pools is the Survivor Tree, a tree that withstood all the damage and carnage and is now looking strong and inspiring. The rest of day was spent walking to Battery Park, then strolling along the High Line (built from an old rail line) and then finishing at Central Park people watching - people doing all sorts of activities, such as yoga, clown and musical acts, skating on an improvised rink, rowing in the lake, and lots more. It's obvious that Central Park indeed is central to life in New York. We were on our way to meet our friends Roland and Alice for dinner, when we stopped at the Dakota building to pay homage to John Lennon. It was here where he and Yoko Ono lived until his death on December 8, 1980, when he was shot and killed on the sidewalk, at the entrance of the Dakota. Due to a misunderstanding of where the restaurant was located, we didn't meet our friends from SLO for dinner. Tired and hungry, we found ourselves at a different but excellent Italian restaurant - Gina LaFornarina on Amsterdam Street. The following morning, we made our way to the car rental agency at JFK, using the metro. We picked up our Chrysler van and drove out of NYC like we knew what we were doing. We only made one minor navigational error and soon we were on our way to Providence, RI. It took about four hours to reach the Annie Brownell House, our accommodations for the night. We checked in and were off to find Lauren, the daughter of a friend of ours. Lauren attends the Rhode Island School of Design and is working towards her master’s degree. She showed us some of the RISD sprawling campus, including the unique library located across the river. A view of the library building and surroundings of Providence. In the evening we first met our friend, Kersti, (whose cottage we were staying at in Maine) for a glass of wine and afterwards had dinner with Lauren at the New Rivers restaurant, a small and cozy establishment located near RISD. 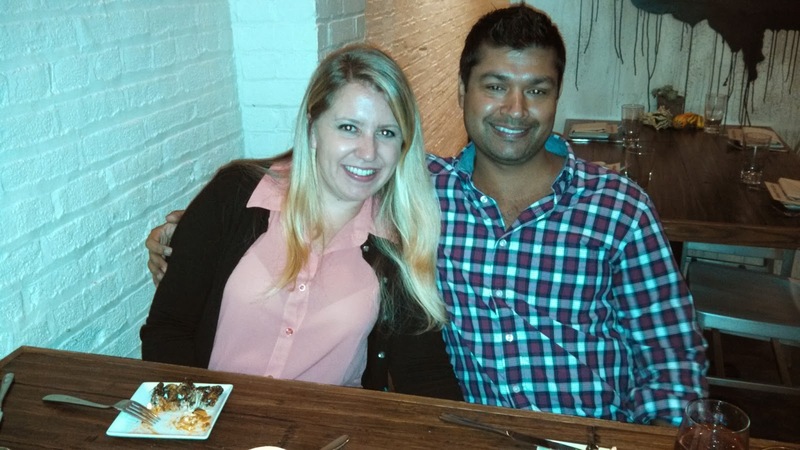 With menu choices such as Rhode Island Blue Fish, clam bake and scallops, we all fared well. Needless to say, dinner was delicious. The following day we had a longer than expected drive to Jonesport, Maine. We arrived just before sunset - critical because we had to find the hidden key to our waterfront cottage during daylight. As we drove up we were taken in by the waterfront setting. Looking out from the deck of the cottage, we had a quintessential view of the New England rocky coastline. Spectacular. Inside, we found a rustic and cozy cottage with a comfortable bedroom, another tiny bedroom just enough to fit a double bed, and a loft with bunks and a balcony. Our view as we drove up to the cottage and parked. Early the next day, after breakfast, we headed out to find Vicky, our lobster connection that Kirsten had told us about. We found Vicky on the dock getting the bait ready for the next catch. She told us to come back at 2pm when the smaller, tastier lobsters were due in. The other stops for the day were at the Blueberry House and at the Cross Roads organic farm, where we bought enough vegetables and fruit to accompany the lobster dinner we were planning. We had our pick of the litter. Maarten and Gabi getting ready to take our new friends home. Maarten checking out the catch. Another shot of the lobster dock. At precisely 2pm, we returned to the lobster dock. Vicky motioned us over and told us that the lobsters were in. Thirty five dollars and change bought us five regular sized lobsters and a giant one that we were planning to have as an appetizer. We had the makings of a great dinner. It was a bit of work coordinating and preparing all the different items on the menu. But when it was all done, all the fuss and work was worth it. The crustaceans were delicious, as were the organic veggies. Definitely a memorable meal. Acorn squash at the at the Cross Roads Farm. The next morning we drove to Acadia National Park. Bar Harbor is off to one side of the park. Unfortunately, the town was overrun with tourists from three cruise ships that were anchored off shore. We didn’t even stop. The park has a circular, one-way loop to drive that gives one ample views of the surrounding area. For those with more time there are lots of hiking trails all over. The rugged, rocky shoreline was quite beautiful and offered excellent stops for a picnic. A rocky shore in Acadia. The ladies showing off the view from Cadillac Mountain, the first spot in the U.S to see sunrise. The last place we visited in the park was Cadillac Mountain. At 1532 feet, it’s the highest peak on the coast in New England and therefore yields the first glimpse of a sunrise in the U.S. The summit had a superb view of the surrounding area and the nearby islands. From there we also had a view of Bar Harbor, where we could see three anchored cruise ships. On our return home, we stopped at one of the many roadside stands offering clams and bought a bag full. Dinner! The crew ready to depart. In the morning, after cleaning up the cottage, we drove from Jonesport to picturesque Camden. Unfortunately, we were there only for a brief stop. Our destination that day was Franconia, NH and it was still a long ways off. The drive from Camden to Franconia was nothing less than spectacular albeit long. We drove past quaint towns, lakes, ponds and mountains seemingly painted with stunning colors. This was the heart of New Hampshire’s famed White Mountains. Erika and Gabi in Camden. In the morning we visited the Mount Washington Resort, a grand and majestic hotel dating back over a century. In its heyday, the hotel catered to the wealthy Easterners including U.S. presidents. Then in 1944, the hotel hosted the Bretton Woods International Monetary Conference. It was during this conference that the World Bank and the IMF were created, and the gold standard was set to $35 an ounce. During our day's drive, we also encountered small lakes and covered bridges. One of our favorite covered bridges was in the town of Littleton. The setting was beautiful. The following day our drive took us to view the "Old Man of the Mountain". Unfortunately, the rocks that composed the caricature of an old man, over time have broken off not leaving much to see. Still, the area was picturesque. We continued onward to the Flume Gorge at Franconia Notch. The gorge, offers a unique and spectacular walk along a river mostly on wooden walkways and stairs. A splendid view of one of the may covered bridges - still operational. 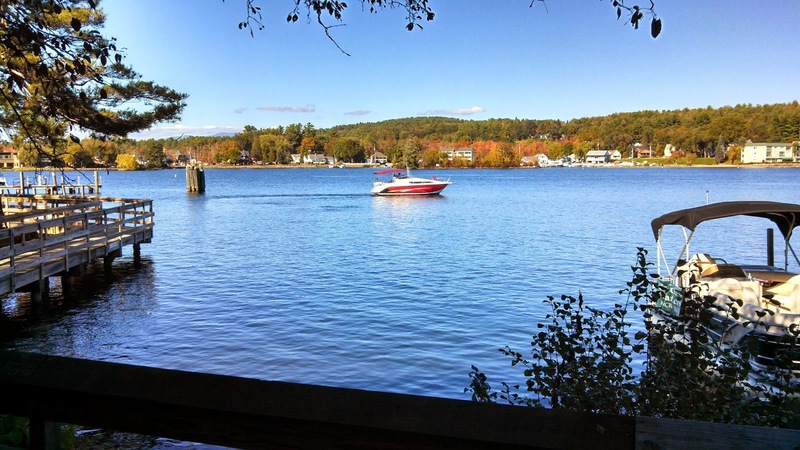 Lastly, we drove to the lakeside town of Meredith, NH, where we had a late lunch along the lake front. It’s really not all that special of a place, but we were attracted to the village's name. 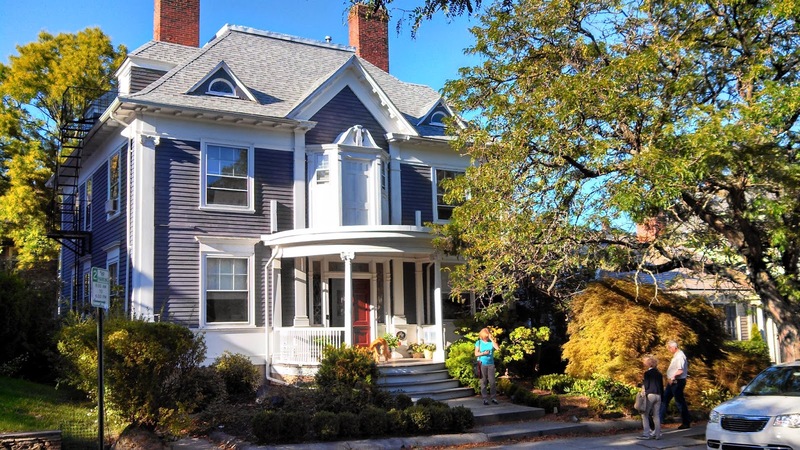 In the morning, we again packed our bags and drove on the narrow country roads from Franconia, NH, through Waterbury and Montpelier, the capital of Vermont. We arrived at our destination, Stowe, in the latter part of the afternoon. Fall colors were becoming more vibrant and vivid. 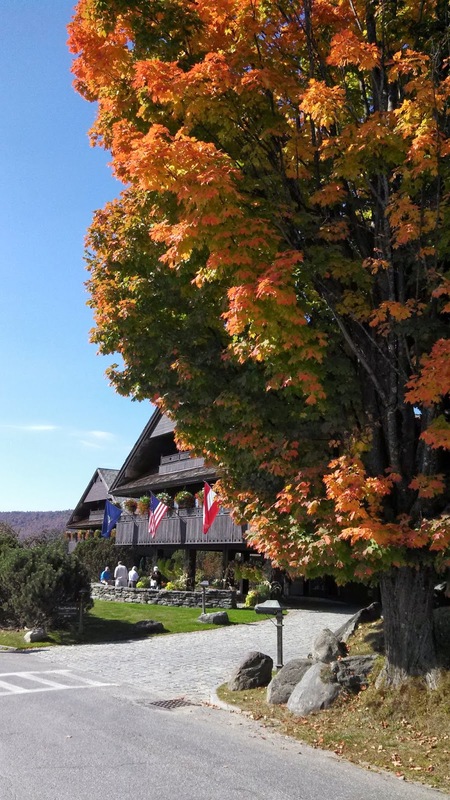 To us, it was apparent that leaf peeping season was in full swing. Leaf colors ranged from shades of green to bright orange, red and yellow. 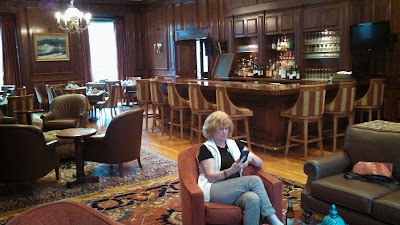 In Stowe, we stayed at the Ye Old English Inn, a comfortable inn with a pub. Across the street there was a walking path that led into the village. The path meanders along pieces of art that are on display as well as for sale. Pretty unique. The following day we visited the historic von Trap Lodge, situated on a beautiful setting, high up on a hill (I think they call them mountains here). Made famous in the movie “The Sound of Music“, the von Trap family built and opened a rustic lodge on this spot in 1950. The sprawling lodge that’s here now is new, since the original one burned down in the 1980’s. The rest of the day was spent on short hikes and a backwoods drive to the small town of Cambridge where we visited the Boyden Valley Winery. The white wines were reasonably good and the red were decent. But overall, the wines were a bit disappointing, for being rated one of Vermont's best. In the evening we had a fabulous steak and ale combo dinner at the Whip, a restaurant in Stowe. The following day we made a circular drive from Stowe to the Lake Champlain area including Isle Motte, North Hero and Brunswick. Along our route, we took a break at Joey’s Junction Bakery and Cafe for some strong coffee, baked goodies and their serendipitous odd art. At North Hero, we dropped in at the huge General Store and had a picnic lunch along the lakefront. North Hero on Lake Champlain. Later in the day, we made a brief stop in Brunswick, a centuries old university town. We took a pleasant stroll along its lakeside boardwalk. On our return to Stowe, we came upon a unique wine store in Waterbury called the Cork Wine Bar. The place offered good wines, good prices and a superb variety of mostly French and Spanish wines. Afterwards we walked across the street and had a tasty dinner at the Prohibition Pig. 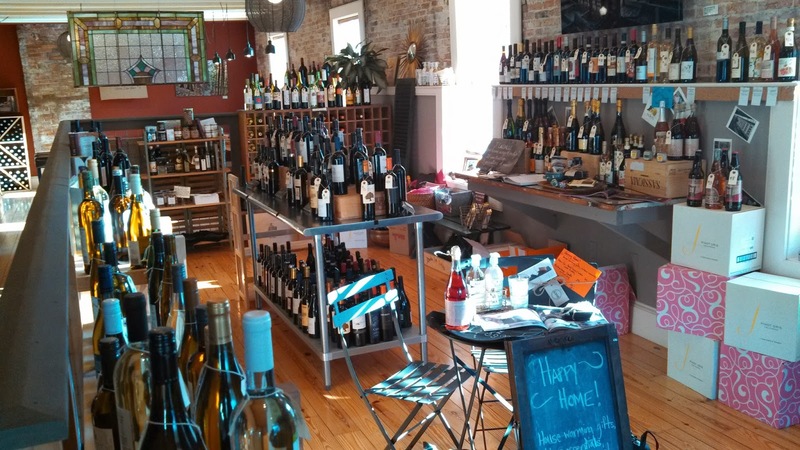 Cork Wine Bar in Waterbury. The drive from Stowe to Boston took us through more colorful foliage. Our first stop was back in Waterbury, at the Green Mountain Coffee Company. The offered an excellent presentation of the process of coffee growing and coffee making, and more importantly, coffee tastings. It appears that the coffee tasting world is much like wine tasting, with even more nuances (1200 descriptors versus wine's 800). Pumped up on coffee, we were ready to hit the road. Our next stop was at an Vermont Icelandic Horse Farm that Diane wanted to see. Although they offered trail riding tours in a bucolic and serene setting, we didn’t have time for that. Besides, Erika and Gabi, having never been on a horse, weren’t showing the necessary enthusiasm, even if this particular breed of horses was supposed to be calm and gentle to the rider. The rest of the drive to Boston was beautiful. Arrival at our Airbnb homestay was a bit unnerving. The neighborhood was a mixed bag. The street that our house was on seemed fine. But a block away, the streets were littered and had some unsavory looking characters. Yet once we settled into our "Green Villa", an old Victorian styled home, the neighborhood didn't seem all that bad. 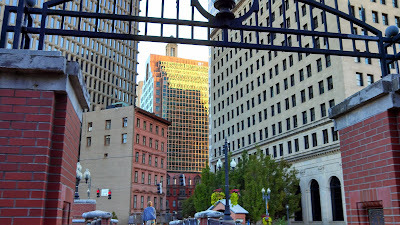 In the morning, we drove into Boston (rather than take the metro). 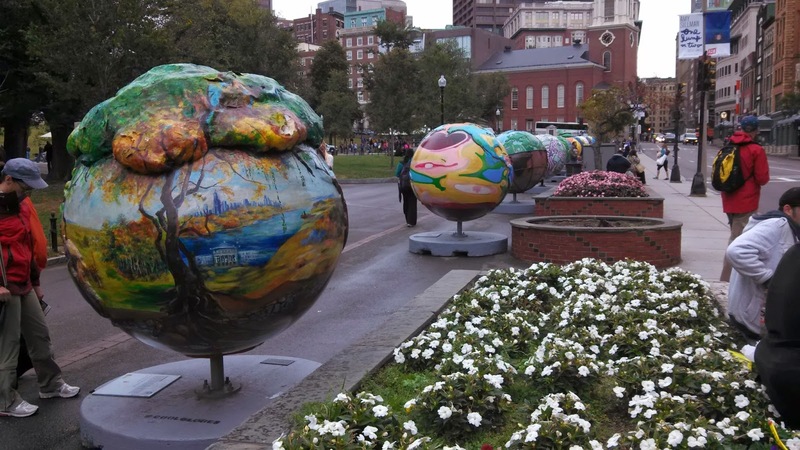 Once parked, we split up, so the ladies could pursue a bit of pent up shopping desire, while Maarten and I walked along the Freedom Trail. Unfortunately, the one thing that Maarten and I really had wanted to see - the USS Constitution (aka - Old Ironsides), was closed due to the government shutdown. Dinner at the Green Villa. One sad Dutchman looking at the USS Constitution. Closed because of a government shutdown. 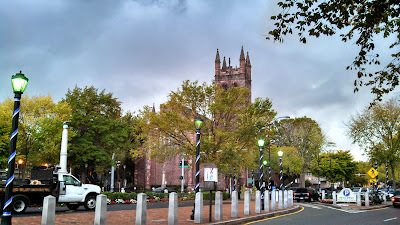 After our Boston adventure, we all drove to Harvard University in Cambridge and took a brief tour of the campus. Later that afternoon, Diane and I had made plans to pay a visit to our old friends from the Bay Area. Norbert and Leslie had been neighbors of ours when we lived in the Santa Cruz mountains. This was when their son Adam and Meredith were 3-6 years old. We calculated it to be over twelve years since we last had seen each other. We all looked a bit older, but not much else seemed to have changed. At Leslie and Norbert's home. We had a grand reunion at their unique home, a converted brick commercial building, re-purposed into a residence. They had prepared a scrumptious dinner of salmon and asparagus, followed by homemade apple pie. Although we could have talked through the night, they had to work in the morning, and we had a long drive back to the Green Villa. Hopefully, it won’t be another twelve years before we see each other again. In the morning, after a leisurely breakfast, we drove to the Plimouth Pilgrim Plantation in Plymouth (no, that's not a spelling error). The Plantation is a re-creation of the 17th century village when the Pilgrims arrived in the New World on the Mayflower. It has reproductions of timber-framed houses that were typical in the village and it shows how the newly arrived Pilgrims and their neighboring native Indians lived (not to mention, what they thought of those white people). The volunteers they have at the village take on the identity of actual people who lived there and tell stories about their lives, coming over on the ships and their lives in the village. The Plimouth Pilgrim Plantation - one of the native Americans. A view of the Pilgrim village. Above (and below) are some of the volunteers dressed in typical period clothing. A view of Plimoth Plantation. Afterwards, we drove back home to Boston and relaxed while Erika and Gabi began packing for the journey home. For the evening we had planned a celebration dinner in Boston. We chose a restaurant in the North End, an area otherwise known as Little Italy. 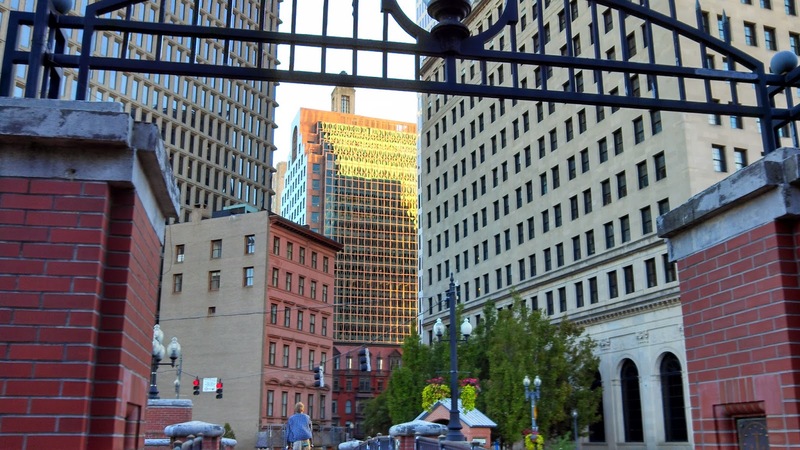 Full of restaurants, pastry shops, bars and deli's, it's a lively part of Boston. We had reservations at Maria's Cantina and were a bit early. After we turned the car over to the valet (which was the easiest way to get a parking spot), we strolled around Little Italy. We ended up buying a small bottle of Limoncello at a wine store - for dessert when we got home. The dinner was Erika's treat and it was a good one it was. We all were treated to delicious meals and fine wines. One of the home-made pastas at Maria's Cantina. The last evening all together at Maria's Cantina. When I awoke, early Sunday morning, I already could hear movement from Erika and Gabi’s room. Last minute packing was taking place. After a cup of coffee and a light breakfast, we took them to Logan Int'l and were lucky enough to find the American Airline attendant whose name was Meredith. After telling her that we had named our daughter "Meredith", she was extremely helpful and somehow was able to transfer Erika and Gabi's super-sized suitcases directly to Air Berlin, not even charging them the standard checked baggage fees. We hugged and said our goodbyes at the TSA line and walked back to the van. Maarten, Diane and I were then off to our next adventure - Connecticut. For several hours, from Massachusetts through Connecticut, we drove through eye-catching foliage, often on narrow, rural roads. We made one stop for lunch at the Vanilla Bean Cafe, a quaint spot with good food, strong coffee and yes, art for sale. There seems to be a common theme among these cafes. On our way to Haddam we stopped at the Vanilla Bean Cafe. Along the way to Haddam. By mid-afternoon we arrived at our our destination - the Nehemiah Brainerd House, a Bed and Breakfast in the village of Haddam along the Connecticut River. It was a verdant, quiet and peaceful setting, although we were a bit disappointed that the river was not visible. Our hosts had done a superb job of renovating the home (which dates back to 1765). In the evening, for dinner, we drove to Middletown, a nearby college town with one wide, main street and a number of restaurants. We chose a Thai restaurant and shared several dishes. The following morning, after a breakfast of fruit and French toast, we drove south through the historic seaside town of Essex. From there we drove along the coast to New Haven, where we were to meet Meredith's friends Kory and Linsay. Along our drive along the coast from Essex to New Haven. Kory went to school at UC Davis with Meredith and Elliot and is from San Luis Obispo. 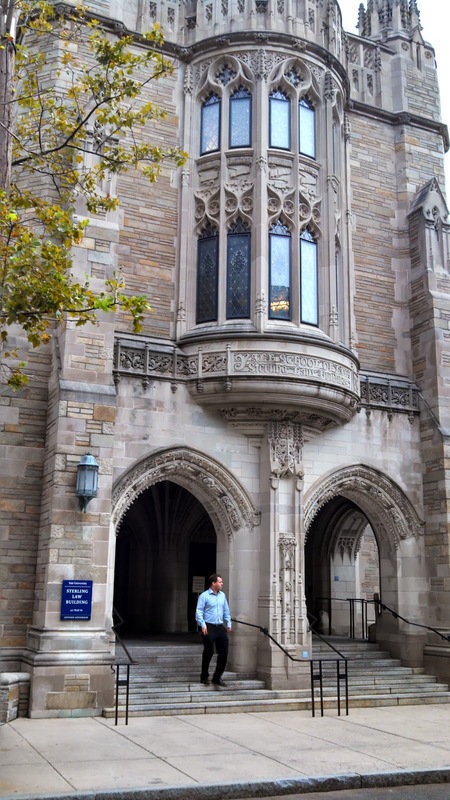 He and Linsay are in New Haven for him to attend Yale law school (that's after he finished his Ph.D. in philosophy at USC). Diane had found us an unusual place to stay in New Haven - the Quinnipiak Club (better known as the Q Club). Established in the 1870's, the Q Club is very elegant and charming, with dark, wood paneled lounges and a beautifully decorated library with beautiful wood paneled walls. After checking in we walked to the Yale campus. 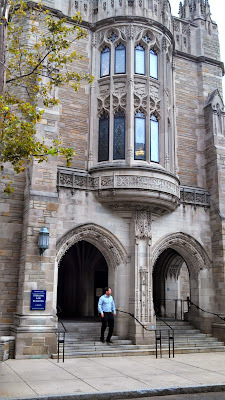 As we poked around the campus, we found the architecture and the feel of the campus to be much different than Harvard’s. A number of the buildings we saw were Gothic in style, although others were modern. The campus is about 300 years old and over the years has had various renowned architects design its buildings. Unfortunately, our walk was rudely cut short by a sudden downpour that unleashed a deluge of rain on us. We scurried back to our hotel dripping wet. Diane in the lounge at the Q Club. 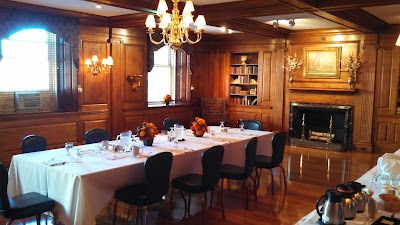 One of the meeting rooms at the Q Club. In the evening, it was only a short walk from the Q Club to Kory and Linsay’s place. It was fun to see them in this totally different setting. 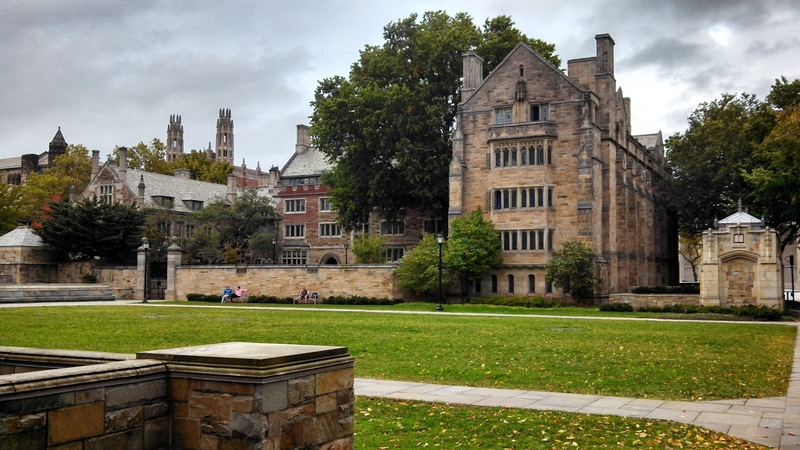 We had pizza, salad, beer and wine and shared great conversation over several hours about Yale law school, Linsay’s counseling work with Sandy Hook Elementary School kids and their new life in New Haven. Maarten, Linsay, Kory, Diane at their flat in New Haven. In the morning we drove back to NYC, dropped off Maarten at his B and B in Brooklyn, took the rental van back to the agency, found our way back to Penn Central, and caught a bus to Philadelphia. Diane and I were on our way to visit with Wes. The new Bolt bus system was comfortable, inexpensive and on time delivering us to Philadelphia even earlier than anticipated. Wes came by and picked us up in his old Suburban and we soon found ourselves sitting in his home in Port Deposit clinging glasses of champagne. It was a good reunion. Even though I had seen Wes only a few months before for our annual Chesapeake Bay cruise, for Diane it had been about twenty years since she had seen Wes. Diane, Wes and I having dinner at his home in Port Deposit. Taking a stroll along the banks of the Susquehanna River in Port Deposit. The following day we drove in to Baltimore to visit Wes' friend, Susan. After meeting up with her at her beautiful home that overlooks Baltimore harbor, we took a walk around the waterfront, which included a tour of Pierce Park, a park that was created in memory of Susan’s late husband, Pierce Flannigan. In the evening the four of us had dinner at Peter’s Inn restaurant, where we each were treated to a scrumptious dinner (Susan appears to know a number of these restaurateurs on a first name basis). Susan, Wes, Diane and I at Pierce Park in Baltimore. The next day brought rain. As Wes had to work, Diane and I relaxed in the morning in Port Deposit. 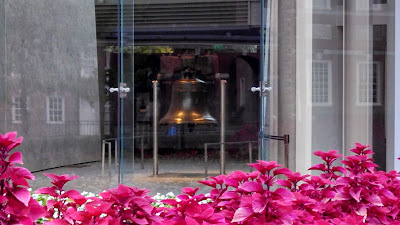 In the afternoon, we drove the Suburban into Philadelphia to visit the Liberty Bell. Even though the venue was closed, we did manage to get a glimpse of it - enough to take a photo. 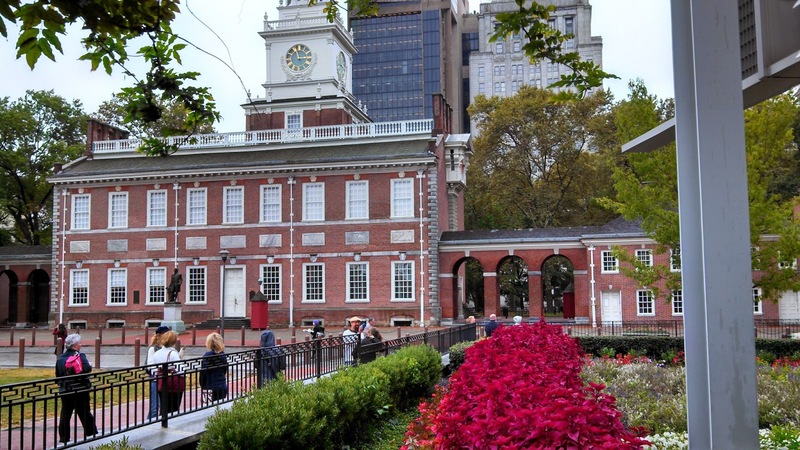 Across from the Liberty Bell, also closed, is Independence Hall, the birthplace of the Declaration of Independence and where the U.S. Constitution was signed - it's where it all started. After a cup of coffee, we drove on to meet with one of Diane's former colleagues from Hancock College. We met Jane, Mark and their young son at the Cheese Factory restaurant at the King of Prussia Mall, recognized as being the second largest mall in the U.S.
On the following day, after a short stint at work, Wes drove us to the Baltimore train station where we parted and took the train to Washington D.C.. It all went flawlessly, and in the blink of an eye we were in Washington D.C., sitting on the couch, talking to Corinne in her new condo. 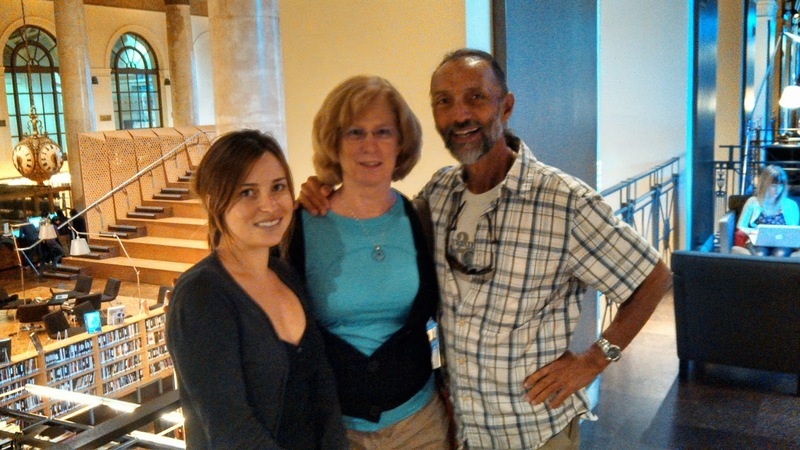 It was great to reconnect with Corinne, the daughter of friends of ours who we have known for nearly forty years. We also got a chance to meet her new boyfriend, Gaurav. Corinne's condo is in an up and coming area near 14th St. and R St., full of lively restaurants, bars and cafes. One evening, the four of us went to the newly opened, Graffiatos, an Italian restaurant in (of all places) Chinatown. The fare could be described as Italian cuisine done tapas style. We shared several of the small plates and had an excellent and savory meal. Corinne and Gaurav at Graffiatos. On another day, my friend Colleen came by. 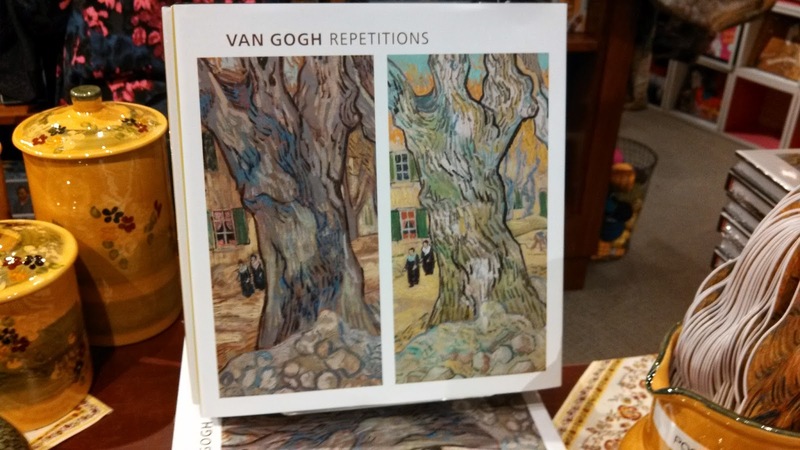 We headed out to the Philips Museum to see a van Gogh exhibit, but discovered the lines were too long. 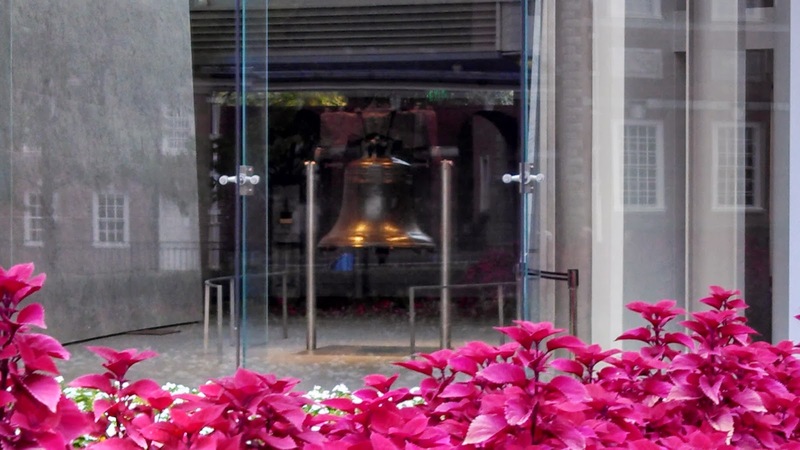 With the government shutdown, the few museums that were open, were very popular. 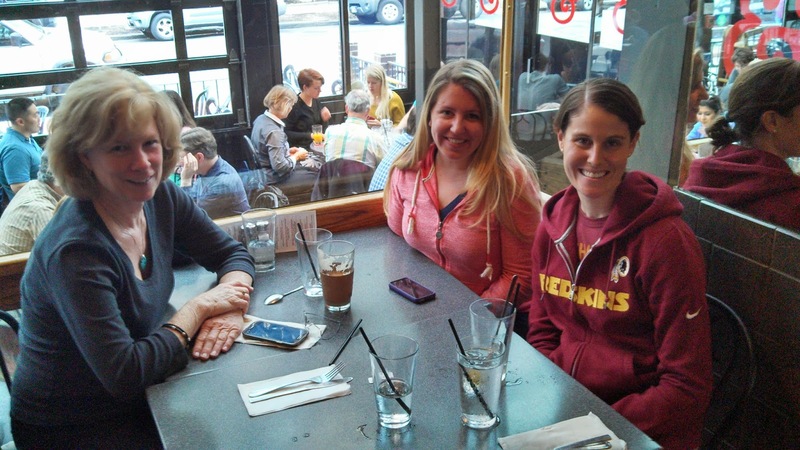 We opted instead for a long walk of the Mall and a visit to the old Post Office headquarters, where we had lunch. One of the many federal buildings along the Mall. The Washington Monument wrapped in scaffolding to fix cracks, the result of an earthquake. The old post office headquarters now owned by Trump. Inside the post office building. Colleen and George at lunch in the post office building. A view of the Capitol building. On Sunday, I did get an opportunity to visit the Philips Museum. The van Gogh exhibit was entitled "Repetitions". The exhibit explored the artist's technique of painting the same scene several times over but differently. It was a superb exhibit that I thoroughly enjoyed. No photos allowed of the real art work, so the book will have to do. Afterwards, Corinne, Diane and I met Meredith’s college friend, Leila, at Kramer's bookstore, near Dupont Circle. Although Leila was in a hurry, it was fun to catch up with her busy and exciting life at the State Department and at DOD. Diane, Corinne and Leila at Kramer's Book Store. On our walk home, Corinne took us to her office. She showed us the cook stove project that she heads up for a U.N. foundation, who's goal it is to provide low cost, efficiently burning stoves to third world countries. We saw several of the actual stoves that have been developed for production. Quite a job Corinne has running around the (third) world getting people to accept and produce these types of stoves. These stoves literally saves lives, lessen the consumption of wood and help the environment by creating a smaller carbon foot print. Definitely a win-win situation. 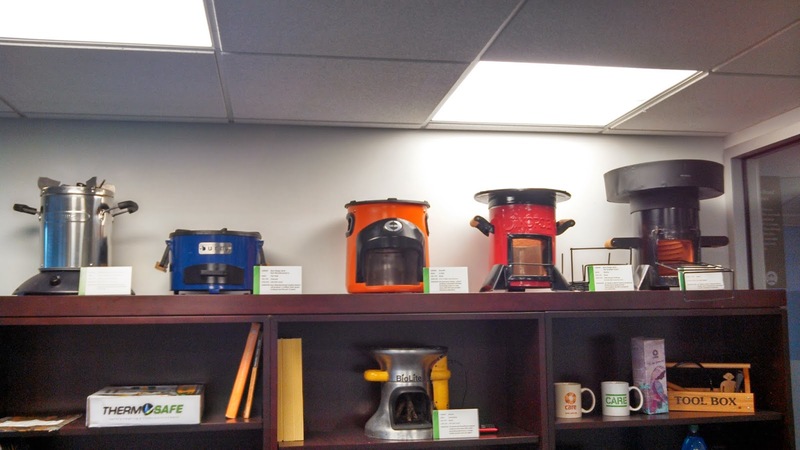 Some of Corinne's cook stoves. On our last evening, the three of us ordered Thai food from a local restaurant and ate at home. It was then time to say our goodbyes to Corinne since she was going to Gaurav’s place for the night and we were flying back home in the morning. What a great trip it had been.